The Bank of America Winter Village at Bryant Park opens this Friday, and we couldn't be more excited for the shopping and skating season to begin! For those of you who have been tracking our progress, here is a photographic construction update. The ice rink is officially covered in ice! 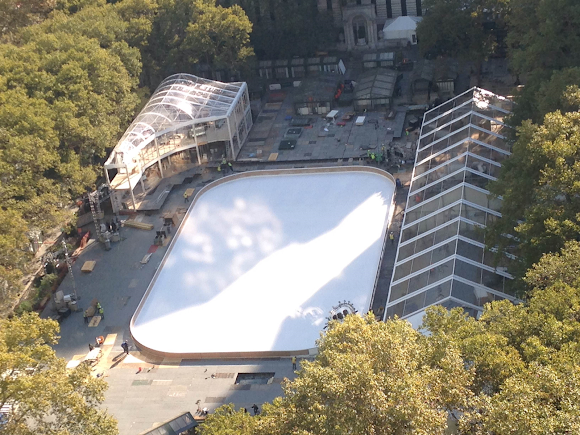 The entire under-rink refrigeration system was built in a week and a half. You can also see that Celsius, the structure on the left, and the skate deck, on the right, are taking shape. Roofs, walls, and floors are nearly all installed for the holiday shops; electrifying the shops is the next step. Our light towers have been installed at park entrances to greet visitors and give helpful information. Barricade covers with the sharp new Winter Village design echo the iconic Bryant Park balustrades.